Free movie? Opening night of a film festival? Sure. I nearly pulled out from attending though. The weather has turned rather foul in Dublin in the past 30 hours or so, wet and extremely windy. There have been news report of overturned vehicles and a tragic freak accident by this very spot where a fallen tree killed a woman. Flower tributes now tie along the sign. However, the weather did improve somewhat in the evening (drizzly with occasional gusts of wind) and I made it to the IFI in Temple Bar. 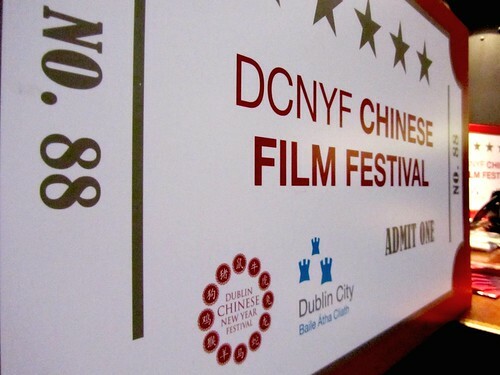 The film festival has been organised in conjunction with Dublin Chinese New Year Festival, but the hope is to turn it into an annual film festival. We saw Bodyguards and Assassins which was very good (if a tad bloody), and the evening was followed by a small reception. The DCNYF Chinese Film Festival will close on 13 February with a world premiere of Blood Oath, directed by Stephen Shin and produced by Zhang Yi-Mou. The director himself will be in attendance, opening the movie and taking part in Q&A at the end. I look forward to that.